Citroën C5 is mid-class cars (Class D) manufactured by Citroën since 2001. The debut of the Citroen C5 took place at the Paris Motor Show in 2001. In the model range of the company C5 has replaced the model Xantia. The car was available in two body variants: liftback and station wagon (C5 Break). Three options were offered: X, Sx and Exclusive. The luggage carrier is quite spacious. There is a relatively large glove compartment in the cabin, and in the SX and Exclusive range there is space for things under the seats, and in the center armrest from behind. The first generation Citroen C5 has a fairly rich list of electronic systems: Parktronic, tire pressure sensors, automatic windscreen wipers, a rain sensor, which, in the event of precipitation, not only wipers themselves throw water from windscreens themselves, but also automatically close the door glass and hatch. Hydractive III hydropneumatic suspension is used on the car. It has two modes of Sport and Comfort, prevents the roll in turns, nodes during overclocking and braking, and also lowering the body when driving at high speeds, reducing aerodynamic resistance and, accordingly, saving fuel. "H" - the highest one to replace one of the wheels, instead of a jack. "P" (200 mm) - used to travel on bad roads at low speeds. "N" (160 mm) - standard for normal riding conditions. "B" (145 mm) - minimal clearance, recommended at high speed. Information about the height at which the body is at the time is displayed on the multifunction display, located in a niche above the center console. The control system based on the analysis of the road condition and driving style automatically changes the characteristics of the elastic elements and shock absorbers. Safety is not the last among the characteristics of the C5. The safety system includes front and side airbags for the driver and front passenger, as well as inflatable curtains. All pillows have two levels of disclosure - depending on the impact strength. All safety belts meet the latest EuroNCAP requirements. The trunk lid lock is blocked at the start of the movement, and the door automatically closes, if after 30 seconds after unlocking they are not opened. The line of power units offers two options: a gasoline engine V6 in the volume of 3 liters and a capacity of 210 hp, a diesel engine with a volume of 2.2 liters with direct injection of fuel with a power of 136 hp Both engines work in pairs both with a mechanical, and with an automatic transmission. In October 2007 Citroen introduced a fundamentally new generation of the C5 model. The car is available only with bodies of a sedan and a versatile person. The new generation of models has grown in size: length - 4.78 meters, width - 1.86, and height decreased to 1.45 meters, making the sedan C5 look more dynamic. The length of the wagon is 4.83 meters. Thanks to the wide wheelbase (2.82 m), the interior of the car was spacious and spacious. The creators paid the greatest attention to the comfort of the passengers. The interior decoration is finished with high-quality and expensive materials, and also decorated with inserts made of matte aluminum. Noise isolation is done in a similar way to the larger Citroen C6, including laminated side windows and windscreen-protected noise. 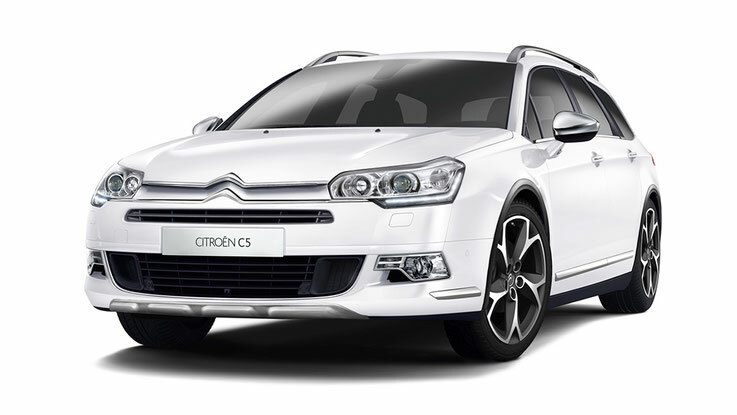 Buyers of this generation Citroen C5 will be able to choose the type of suspension: in addition to the traditional C5 Hydropneumatics Hydractive 3 Plus, the car can be equipped with a cheaper spring suspension. The range of engines includes a wide range of engines: the gasoline four 1.8 and 2.0 liters, three-liter V6 power of 127, 143 and 215 hp. respectively, as well as four turbodiesels - 1.6, 2.0, 2.2 and 2.7 liters capacity from 100 to 208 horsepower. Depending on the type of motors are aggregated with 5 and 6-speed mechanical transmissions or with a 6-band automatic. The list of diesel power units starts with a 1.6-liter four-cylinder HDi of 110 horsepower. Equipped with a sedan up to 96.5 km / h accelerates at 12.2s, hatchback - in 12.5 seconds. Fuel consumption is 5.6 and 5.5 l / 100km, respectively. Next on the list is a 2.0-liter four-cylinder diesel engine. It will spread all over for 9.3 seconds, and a sedan in 9.1 seconds. Fuel consumption is 5.1 l / 100 km for a versatile person and 4.9 l / 100 km for a sedan. Couple it is a six-speed manual or automatic gearbox. The top position of the diesel list is 3.0-liter V6. The hatchback with this engine up to 96.5 km / h accelerates in 8.2 seconds. Spend a 9.6 l / 100km car. The only gasoline four-cylinder engine of 1.6 liters offers 120 horsepower. The universal with it is accelerated in 12.3 seconds. Spent 6.4 l / 100km. The sedan breaks out in 12.2 seconds, consuming 6.2 liters / 100km.